I first came across the Slow Movement in late 2007. In early 2008 I had the idea of taking the fundamental philosophy of the Slow Movement (as I understood it – the great thing I love about the Slow Movement is that not organised and controlled by a singular organisation and is propelled by individuals. Which means it is different from person to person) and combine it with the tools, techniques and strategies I had learned from 8 years experience (at the time) of NLP (Neuro-Linguistic Programming), hypnosis, coaching, meditation and other bits and bobs of psychology and productivity (through work I had done with businesses and lecturing on Aston Business School’s MBA course) to generate ways to help people Slow down, become more mindful and productive and reconnect with their lives. At this point I had been running my own coaching and training business since 2000, it had grown from strength to strength, but I wasn’t happy, I was stressed and I didn’t know why. I had started to be turned off by the whole “self help” field and was finding it horribly insincere and impatient. I was getting more and more clients expecting and demanding instant fixes to problems , these expectations were being fed by the vacant marketing of snake oil salesmen who seemed to be filling up the field. I was trying to do too much, to please everyone, which ironically meant I wasn’t getting anything finished, or anything finished to a decent standard at least. I needed to strip back what I was doing, simplify and get back to basics (and what I loved doing). The irony was I hadn’t always been this fast and stressed, I had be seduced by the idea that “faster is better” and impatience was a virtue without really realising it. Before getting involved in NLP, coaching and training I had been practicing Buddhist meditation, Tai Chi and Yoga (very Slow pastimes!). It took an accident to show me the way! I ordered “In Praise of Slow ” from Amazon by mistake… This introduced me to a different way of thinking and living. It came as revelation that I didn’t need to be seduced by speed, that there is another (better) way! 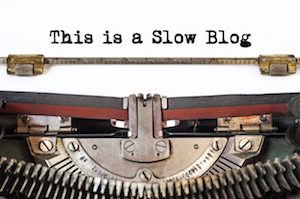 I started this blog as a way of recording my exploration into the Slow Movement and associated fields. It didn’t land fully formed and has been a rather organic, and at times chaotic process, following my fascination and seeing where that took me. Which means it has meandered and wandered and often lacked focus. The first thing I did ((after researching The Slow Movement and related fields intensely for around 6 months) was distil my “Slow Philosophy”. This was my starting point. Recognising that time is precious, but rushing to try and fit more in is not the answer. That taking the time and effort to appreciate what is now will be much more fulfilling than filling your days and doing this just to get somewhere in the future. Embodied by being centred, relaxed, unhurried, unrushed, unflustered and acting spontaneously in the right way (at the right pace) in a given situation. This manifests itself as different ways for different people, depending on their interests and experiences, but shared values are: Finding the right pace to do things, appreciating the present moment, community and co-operation (rather than competition), manners and making meaning connections with people. In all areas of life: business, arts, education, sports, transport, anywhere! About being slothful, lazy or ignorant. In fact just the opposite, it is about being mindful, aware and intelligent in your actions. Very quickly I realised that, to me, the Slow Movement, and slowing down came from the inside out. The key thing to me was to change the way we think. Most Slow Movements seem to me to be outfacing and external in nature: slow food, slow travel, slow cities, etc and no one was considering the fact that, before we could change the way we live, we need to change the way we think. It has always been a key philosophy of mine and something that has underpinned my work since I started out in the field was that, before we can even attempt to make changes to our own external world we need to change our internal one (our thoughts and emotions). So many people get this the wrong way round and wonder why they cannot get the life they crave. They try and make changes to their external world hoping these actions will change their thought processes and emotions. I started using the phrase “tortoise mind” to describe the mindset I wanted to develop, in comparison to “hare-brained” which seems to be how most people think and act. Once I had that (and that came to me quite late on this process), I started to focus on how develop it. I used the term idler as a short hand label (probably because I was first re-introduced to this Philosophy by Tom Hodgkinson’s excellent Idler periodical) for someone who had embraced the Slow philosophy and developed their tortoise mind. Being idle, to me, wasn’t about being lazy, stupid or slothful, it was about being efficient, unflustered and unhurried, in the way an engine is being most efficient on or just above it’s idling rev range. The term idle has become something rather pejorative and negative, yet great minds, from Diognese and the Cynics, to Seneca and the stoics, the Buddha, the Romantics, and people like Theroux, Jerome K Jerome, Bertrand Russell and Will Self (to name but a few, I could write much, much more – for a more detailed history of the Slow, why not grab my “Welcome to the Slow Life” audio book here) have spoken of the virtues of idleness. So, after a bit of experimentation, I realised that I needed to develop something to aim for, the archetypal idler, and then work towards achieving that. Of course, this archetype is different for everyone and people interpret the Slow Philosophy in different ways and to different degrees (that’s what I like about it, it is an art, everyone is different), so you need to develop your own vision to how you want to be. For me it was an image of a person in an airport, you can read the details here. What attributes does the Idler have? The past has gone and the future, well, you can’t hang your hopes on it… There is only now. Pay attention! So many of us spend our time day dreaming about thee future or remembering the past, so few of us spend time in the present moment. Gratitude is the opposite of greed. Our consumer society wants us to keep buying more and more things to collect clutter to replace what we have as soon as we are bored of it. It is designed to make us acutely aware of what we haven’t got so we will crave it. This grasping and craving means we will never really be happy, as soon as we have that one thing we thought would complete us we grow used to it and want something new. Be grateful for what you have. Make a list each. Compassion isn’t very trendy any more in this Hare Brained world and we are all out to get what we can for ourselves. Being hare brained is self centred and solipsistic. Being Tortoise Minded is about connecting with the people around us, being polite, thoughtful and well mannered. We are all together on this lunatic asylum of a planet and everyone is just trying to do the best they can with the choices and information they have at the time. Remember that. Phil Hine describes confidence as “being relaxed in the present moment”. By relaxing our body we relax our minds. We can think more clearly and positively, we can also reduce stress and toxins in our body and feel more energised and focused. These 4 keys have no hierarchy, they are equally as important as each other. Think of them as threads that need to weave themselves through you psyche to hold it all together. Of course we can add things to this list like simplicity or organisation, but these are secondary traits that will come naturally once you embrace the 4 keys. So, what does the future hold? Well, I will continue to refine what it is I am doing and explore and develop new ideas and strategies. I fancy spending some time looking at how we can implement these Slow strategies into the workplace and how by embracing the Slow Philosophy we can actually become more productive and successful, but with less stress and waste (as William Morris puts it “useful work rather than useless toil”). Some of the ideas I have are rather grand, others very simple and down to earth. Work wise (I have never made any excuses about the fact I am make my living through this site!) I want to increase the number of clients that I have, and start to drip feed out quality information products to help people, including guided mediations, a (long overdue) eCourse, and a book (a proper book, not an ebook, I like proper books). I have taken my time as I wanted to be clear about what it was I am actually doing before I released anything. I am still doing coaching and training in NLP, and have some new exciting things going on over there too, but here is not the place to discuss my plans with that (although they do dovetail). And I fancy a facelift of this site too. Not that I don’t love the job that Eric did when he set it up for me, but that was a year and half ago and a nice redecoration is probably due. But that will have to wait a little while yet. Right then here is to a Slow and Successful 2011, I hope you stick around for the journey!